With the handy push and twist action to open, this attractive latch is ideal for keeping cupboards latched, locked and safe. My little Niah is almost 1 now can you believe it?! This time next month I will be preparing for my little girl to wake up as a one year old - no baby anymore. As any parent we want to ensure our children are in a safe environment and being that you are at home majority of that time where your child is you need to ensure you have baby proofed EVERYTHING! Niah is getting into everything and we are in the middle of baby proofing things as we go along. They say that to find all those points you need to baby proof that you need to bring a toddler into your house and let them into everything as they will always find things they shouldn't be getting into. Right now we are experiencing that with Niah so as she goes along and we find her in this cupboard or opening this door and her new thing going into the ensuite bathroom and standing up against the toilet trying to open the toilet boal lid we gradually getting there. Dreambaby was recently introduced to me to use within our home and the Dreambaby General Purpose Latch was one of the first things to try out. I was thinking of putting this latch onto the fridge not because Niah has worked out how to get into it yet but she is trying so I was thinking ahead but this latch ended up going onto our low line entertainment unit which has two cupboards, one on each end - one of the door handles have been pulled off by Niah so that one stopped her from getting in their but the other one is where we put the latch, it has worked a treat and Niah can't get in there, nor can I half the time but you know it's doing the job so that's what counts hey. The Dreambaby General Purpose Latch isn't those dull looking ones, this latch is pretty and sits nicely in a home decor. It has a flower shape on both sides of the latch. 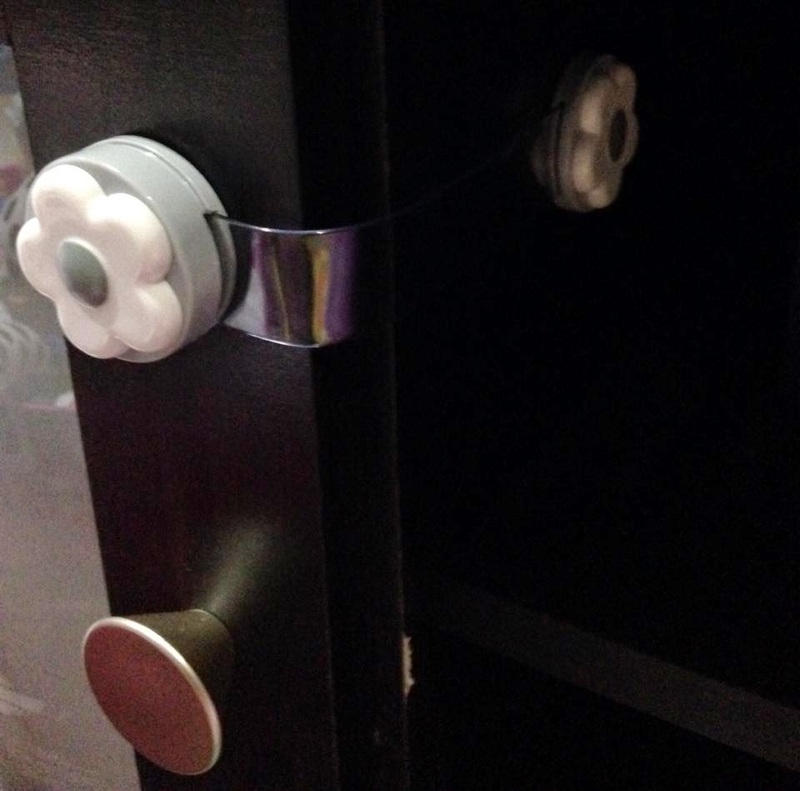 Majority of the baby proofing safety devices always seem to be a bit parent proof as well and this was a little hard to get the hang of at the start when I was first trying it out but you get the hang of it eventually. 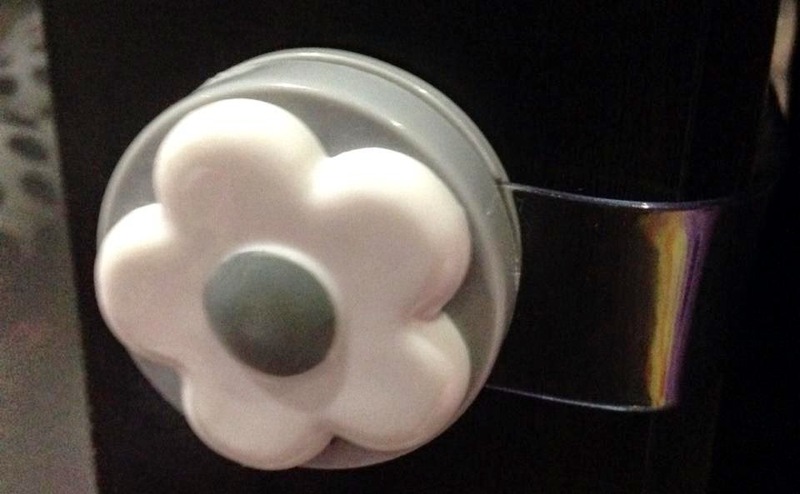 It's a device where you push in the flower button and twist at the same time to release the plastic thick strap piece and then to lock back up you place the plastic thick strap back into the little slot on the flower button, push the button in and turn back around so it locks the plastic strap into place. You would place this latch onto a corner of a cupboard, door etc somewhere that one of the flower parts can be on one side and the other flower on the other side of an object. Niah has tried getting into the cupboard but obviously can't but it does provide her with a few seconds of entertainment whilst trying to move the flower around and get her way into it. I will definitely be getting my hands on some more of these for the rest of the house!